Mike Sando of ESPN posted a very comprehensive “State of the Cardinals” peice below. There’s no new information, but it’s a nice 30,000 ft. view of camp at the moment. They’re not the team with Pro Bowl-caliber talents Kurt Warner, Anquan Boldin, Karlos Dansby and Antrel Rolle. They’re not the team with established veterans Bryant McFadden, Chike Okeafor, Bertrand Berry and Mike Gandy. They’re not the team that won the past two NFC West titles and posted a 4-2 postseason record. They’re not dead, either. Who are these new-look Cardinals? A trip to training camp at Northern Arizona University provided some clues. This team will be easy to underestimate for those analyzing from afar. What I saw up close was a team with strong leadership — both vocally and by example — throughout its roster. The Cardinals are accountable to one another. I saw an organization with a track record for developing young talent (think Calais Campbell, Steve Breaston and Early Doucet, to name three). I saw a head coach, Ken Whisenhunt, who loves a challenge and thinks the Cardinals will do just fine in one of their favorite roles — underdogs. This team has an edge to it. The Cardinals will compete and they can make another playoff appearance with a little help from their quarterback. 1. What’s up with Matt Leinart? Let’s take a listen to Whisenhunt: “You see it in his body language, you see how he handles himself in the huddle and then you also see it in the confidence when he takes a step and he throws the football, or even when he makes the checks in the run game. There is not the hesitation that there used to be.” If you think that quote reflects renewed confidence in Leinart heading into the 2010 season, you’d be wrong. That’s what Whisenhunt said about Leinart in training camp two years ago, before the Cardinals switched to Warner and won back-to-back division titles. What’s he saying now? Whisenhunt dismisses Leinart’s shaky 2009 performance against Green Bay in Week 17 as a product of unusual circumstances (the Cardinals watered down their game plan with an eye toward playing the Packers in the wild-card round). He points to Leinart’s performance against the Tennessee Titans last season — 21 of 31 passing for 220 yards and an 88.1 rating — as evidence the quarterback knows the offense well enough to succeed even without getting practice reps (Warner was scratched from the lineup shortly before kickoff). 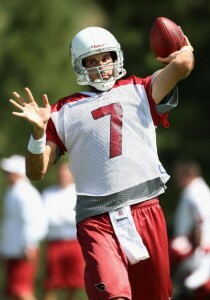 For that reason, Leinart will not get extra playing time during the upcoming preseason. Whisenhunt doesn’t think it’s necessary. Leinart has four seasons in Whisenhunt’s offense. He’s playing for a new contract, backed by two productive running backs and one of the NFL’s elite receivers in Larry Fitzgerald. Leinart will never be Warner, but he will not have to be. He’ll be leading a re-made offense with increased emphasis on the running game. I’m not entirely sold. Leinart has much to prove. 2. What does Joey Porter have left? The former Pro Bowl pass-rusher showed up for training camp in vastly better condition than he appeared during offseason minicamps. His speed and quickness stunned me during the Cardinals’ afternoon practice Monday. Porter even kept pace with Fitzgerald on a special-teams coverage play 35 yards downfield. And he stayed home defending bootlegs. The team’s training camp practice jerseys do not feature players’ names across the backs, and with so many new faces in camp, I double-checked the roster to make sure No. 55 was indeed the 33-year-old Porter. It was him. The Cardinals knew they were getting a fiery personality and potential mentor for some of their younger players. The first few days of training camp have given them reason to think Porter might have more left physically than first anticipated. He had nine sacks for the Miami Dolphins last season and 17.5 the year before. Arizona will put him on the same side as Campbell, who had seven sacks at defensive end. There’s potential for Porter to help this defense more than expected. Let’s see if he can sustain the fast start. 3. Are the Cardinals in trouble at inside linebacker? Veteran Gerald Hayes called out defensive teammates after a rough stretch of practice Tuesday. They were getting pushed around by the offense in the running game. There’s reason to wonder if the Cardinals should expect more of the same, on a larger scale, when the regular-season schedule serves up Steven Jackson and Michael Turner in the first two weeks. Hayes could return from back surgery by then. The Cardinals will find playing time for second-round choice Daryl Washington. They’ll lean on veteran Paris Lenon. They’ll move strong safety Adrian Wilson into the box for run support as needed. Rashad Johnson. The second-year safety appears more physical and closer to contributing. His rookie season was a wash. Johnson might not be needed for extensive snaps, but they might not have to dread turning to him in a pinch. Hayes’ injury status. The Cardinals downplayed their key run defender’s back situation during the early stages of the offseason. They hoped Hayes would overcome the back problems that slowed him last season. Hayes finally underwent surgery. He’s a spectator and the Cardinals miss him. Guard Deuce Lutui was arguably the Cardinals’ best offensive lineman last season. He could have a hard time staying active for games in 2010. Alan Faneca‘s addition at left guard sent 2009 left guard Reggie Wells to the right side at Lutui’s expense. If Lutui fails to win back the starting job — contract issues kept him away from the team this offseason and he reported to the team overweight — his inability to play another position on the line could make it tough for the Cardinals to make him one of the two active backups for games. Jeremy Bridges can play guard or tackle. Rex Hadnot can play center or guard. Even Wells could play tackle in a pinch. This team has strong, outspoken leaders everywhere. Fitzgerald organizes offseason workouts with Cris Carter, Jerry Rice and various current NFL stars, setting a standard for receivers. Faneca provides the offensive line with a needed voice and identity. Wilson is the enforcer in the secondary and the most credible leader on the team. Porter adds veteran leadership and attitude at linebacker. Darnell Dockett holds the defensive line accountable. Speaking of Rhodes, the Cardinals think he can be a good blitzer for them, particularly in combination with Wilson. Faneca, 33, struggles in one-on-one pass-rush drills. The Jets released him even though his salary was guaranteed, making a strong statement as to what they thought he had left. The Cardinals couldn’t pass up adding Faneca to their line. They can benefit from his leadership and experience. I just wonder whether he’ll be one of the two best guards on the team this season, particularly once Lutui rounds into shape. Beanie Wells benefited from his first full offseason in the NFL. Graduation rules at Ohio State prevented him from joining the team until mid-June last offseason. Wells then reported to training camp slightly late and immediately suffered an injury. He appears much better prepared for the upcoming season. Wells is still fine-tuning some aspects of his pass-protection skills. He catches the ball well, though, and his running will set him apart this season. The versatile Tim Hightower remains the starter early in camp and Wells will have to beat him out. I expect that to happen. The Cardinals ran more four-receiver personnel groups than any team in the league last season. I noticed one four-wide play in five practices and that was with backups playing receiver. Teams tend to focus on base packages early in camp. That could partially explain the proliferation of two-receiver personnel groups. Still, the offense appears different from last season and that will carry over into the regular season.